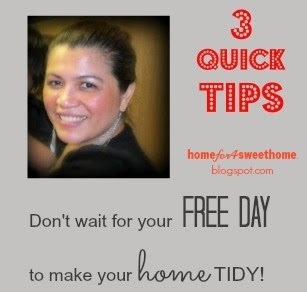 Home For4 Sweet Home: Don't wait for your FREE DAY to make your home TIDY! Don't wait for your FREE DAY to make your home TIDY! 1 Wipe instead of gripe. Everytime you see some dirt on the table, dust on the floor or some splatter on your microwave and oven-top, wipe it. That way it is easier to wipe it off while it's still fresh rather than doing it later on and you'll need more effort to deep-clean it. Wipe that small spill inside your refrigerator before taking that gallon of milk out. That way, you will not forget to wipe because your refrigerator is still open. You don't need to know who did that and gripe about it, just wipe it. 2 Pick it up and put it up. Even how good you are at training your kids to pick up their clothes, toys, shoes and backpacks, they will still SOMETIMES forget to do that. Why not pick it up and put it up where it's supposed to be. But while we do that, let's not forget at our "mom-trick" of sending the message to them by doing the "this-is-not-supposed-to-be-here" kind of look (insert: big-round-eyes-stare ♥). So that hopefully, they will remember to put it up next time. 3 Clean as you go. This is like a universal rule of a good housekeeping. After brushing your teeth, leave the sink and the mirror clean. What's 5 seconds of wiping that mirror clean? Clear out your counter tops from unnecessary stuff - file your mails away. Basket them in if you can't file them right now, that way your counter is clutter-free. 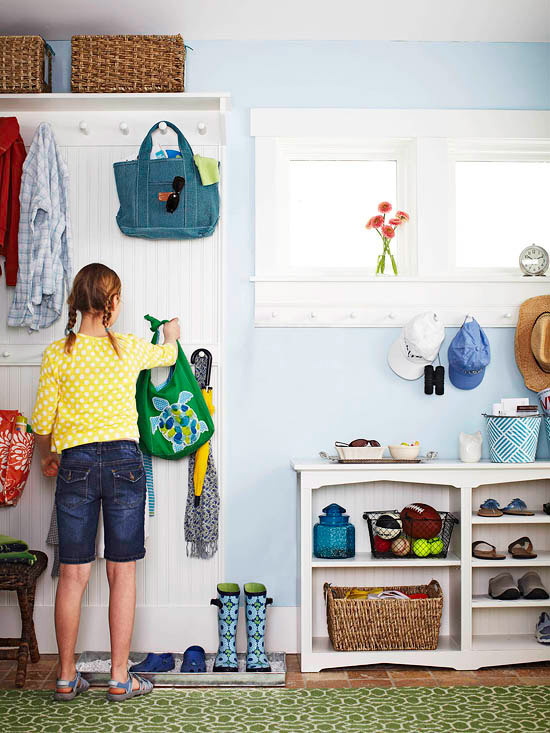 You'll see how much tidier your home will be with these 3 quick tips. These are our great ways to making home-cleaning effortless and less time-consuming. I would love to hear from you if any of these quick tips helped you, so come back and leave me a comment. PS: Fun Friday Blog Hop is now live, so don't forget to link up here. haha you should rosey! let me know if it works! Love these tips! It could really help. Once it piles up it seems overwhelming! exactly karen, so hopefully these tips can help you! let me know if you any of these works, i want to hear it! Just stopping by from the Fun Friday blog hop and started following on GFC. I should definitely be following these tips! great ashley! thanks for linking at the fun friday blog hop! I'm sooo guilty of the "I'll wipe it up later" spilling in the kitchen. And then it's overwhelming later. :) Perhaps I'll implement your trick starting tomorrow. What great tips! I like the wipe instead of gripe. I don't always follow those simple rules but I do know that when I do, I feel like I am more organized and feel more on top of things. Thanks so much for sharing. I just found your blog through the blog hop and I'm SO glad I did. Following along now through blog lovin' :) ! glad you found me patricia and thanks for following me! will be happy to see you back here and also keep on blog hopping! Rea Karen Love these tips! It could really help. What greats tipsThanks so much for sharing. thank you amanda, i ♥ blog hopping! So goodluck and let me know about it, because I want to hear my readers feedback. Thanks for the follow, I am on my way to check your blog. thanks for the follow staci!